Choosing whether to purchase hand-made or machine-made glassware is something many drinkers of high quality alcohols contend with. Handblown glassware can be classed as prize possessions, with the uniqueness of these pieces lending an almost art-like quality. Machine-made glassware suits more everyday purposes, but can still be of a very high quality. In this blog, we will cover the specifics of each of these glass-types and what situation that might be used for. Handblown glassware is typically not well suited to large occasions or everyday use. In the case of a casual dinner party, giving guests expensive handblown wine glasses, especially if a few bottles of red come, may result in disaster. Regular machine-made glassware is thicker than crystal glassware, so it is able to stand a few clinks or knocks without chipping – this makes it ideal for occasions with a few friends. This is especially true of high quality machine-made glassware. Because these glasses are of a higher quality, your dinner guests will nonetheless be impressed. If you are in need of a large quantity of wine glasses for large functions or similar events, machine-made glassware is always the option. There are likely to be some breakages, and with the lowered cost of machine-made glassware, this is a cost that can be absorbed. A large function hall filled with handblown glass is highly inefficient and would be incredibly expensive. Handblown glasses are an excellent means to personally enjoy drinks. Swirling fine wine in a glass that has been made by someone highly skilled in their craft is special, as is recognising the subtle abnormalities in your glass that make it unlike any other. As such, these kinds of glasses are reserved for special occasions. These glasses also require special care, needing to be carefully hand washed after use to ensure the glass holds up properly. For more formal dinner occasions, handblown glasses are ideal. The quality they exude can elevate your occasion, complementing the beautiful cutlery and dinnerware. Regardless of how the glass is made, it is always important to choose something that suits your personal style. Whether you like more classic styles, with their rounded bowls and long stems, or more modern looks that have done away with their stems, don’t make the production method your priority. 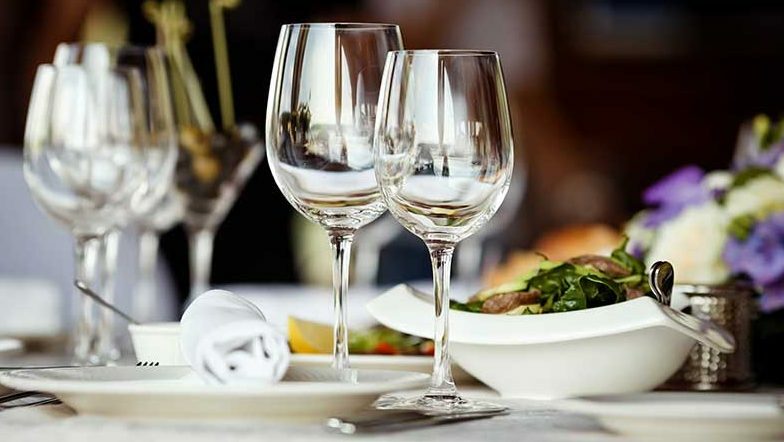 Factors like budget, lifestyle, frequency of use and maintenance are all things that should be considered first, especially with the availability of high quality machine-made glassware available on the market today. Situational use can also mean there is room for both handmade and machine-made glasses in your collection – so why not get both!